The Ards Peninsula in Northern Ireland is such a beautiful and unique place to visit so its great to know there is such a wide and varied choice of accommodation in the local Area. 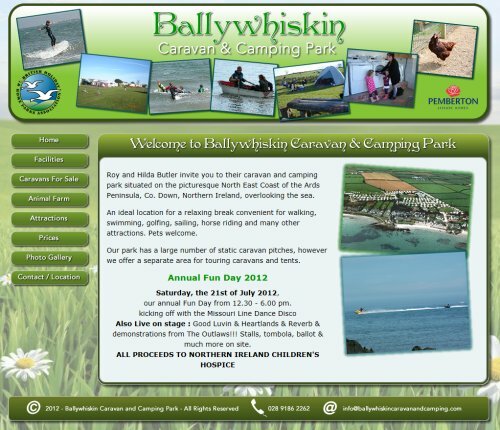 Ballywhiskin Caravan and Camping park is a long established caravan park offering a huge number of facilities for visitors. The park boasts sites for static caravans, touring vans as well as tent pitches and facilities include a hot food bar, on-site shop, laundry on site, childrens play area, toilet and shower block, wifi and the wonderful Animal Park. An ideal location for a relaxing break convenient for walking, swimming, golfing, sailing, horse riding and many other attractions. The website provides visitors with information on how to find the park, local attractions, prices as well as a wonderfully presented photograph gallery.